So as you would have heard in the spine video above that the curvatures of the spine are there for a reason to support the weight of the body. Our spines are not normally straight like a pole. We have a forward curve in the neck, cervical spine, called a cervical lordosis. We then have a backward directed curve in our mid backs, thoracic spine, called a thoracic kyphosis. Finally we have a backward curve again in our lower backs, lumbar spine, called a lumbar lordosis. 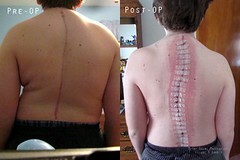 Scoliosis: is a sideways spinal curvature. Scoliosis is when you look at someone’s back from behind and see one shoulder blade sticking further out or higher up than the other usually. Dowager Hump: is an increase in the normal thoracic kyphosis. This is when you see an elderly person hunched over with their head in front of their body and very rounded shoulders from the side. Flat Lordosis: is when the cervical spine or lumber spine curve is flatter than expected. This could caused by a muscle spasm or a just they way your are born. A flattened lordosis doesn’t mean you will definitely have a back pain. This are some of the most common spinal curvature problems you may have heard spoken about or you are worried you may have. But don’t worry as I said earlier we all have curves in our spines. You might be worried about developing a dowager’s hump like your mum or granny. You want to know what you could do right now reading for dowager hump prevention. Well watch this next video on dowager hump exercise for you to try. This thoracic spine exercise video would also be good if you are worried about your computer posture. Try this simple upper body posture exercise and let me know what you think of it in the comments below or let me know what you do to help your posture.